Note: While Cathy Potter is on Sabbatical, Louise is writing all the reviews. Cathy returns February, 2018. 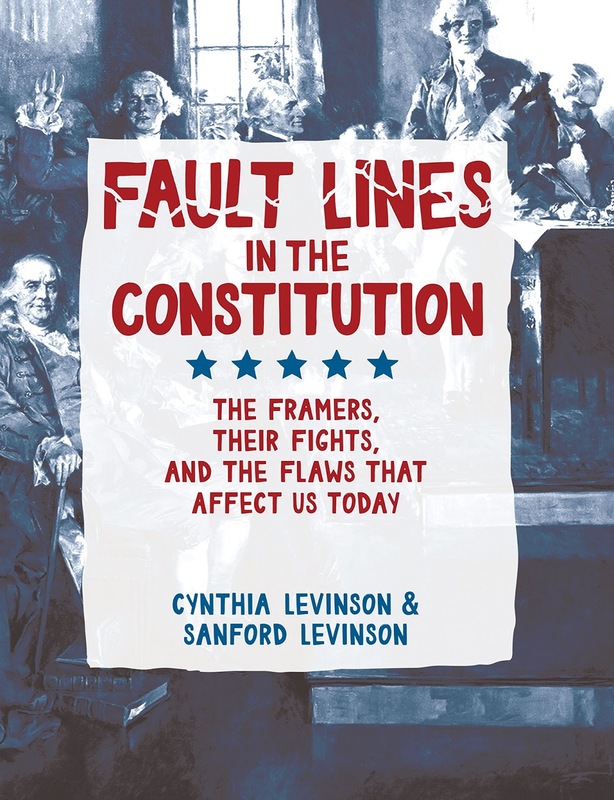 Today I'm taking part in the Fault Lines in the Constitution blog tour. As part of the blog tour, I'm giving away one copy of the book donated by the publisher. The details and entry form can be found at the bottom of this page. "Many of the political issues we struggle with today have their roots in the U.S. Constitution." The Fault In The Constitution offers a historical perspective on the creation of our Constitution in 1787 and how we are still struggling today with those issues. The book is divided up into seven parts with headings: "How Bills Become (Or, More Likely, Don’t Become) Law" ; "Hello, Can You Hear Me?" ; "If America Threw a Party, Would You Be Let In?" ; “Hurrah! I’m 18. Finally I can Vote for the President.” “Not So Fast.” ; "Who’ Running America?" ; "Emergency! Emergency! ; Keeping Pace with the Times". Under each heading are chapters, twenty in all. Each chapter begins with a specific example of where a bill or amendment was stalled that the Levinson’s connect back to a specific section of the Constitution. Each example shows how this has influenced our present society and government. The author’s do include current events, such as the 2016 election. The ending chapter, "Now What?" offers suggestions on four ways to improve the constitution. The author's retain a nonpartisan attitude, never blaming one political party over another. The book is well documented with a timeline of key events cited, several pages of notes, bibliography, a list of the Articles and Amendments of the Constitution, and index. Click here to read a Q&A with the authors. Visit the website by going here to learn more about this interesting and timely book. I used a copy of the book sent by the publisher to write this review. I can't wait to read this, and it's so timely now!! Hearty congrats to Cynthia & Sandy!! Thank you, Louise, for reading Fault Lines, writing this review, and hosting the giveaway! This is so generous of you.